The September 2018 Greater Atlanta Coin Show saw spurts of visitors throughout the day to a bourse filled with dealers and their coins, currency, bullion and other collectibles. As always, we appreciate all of the people who helped make the show a success - the many visitors, the dealers, the security and the hotel's staff. As for the day, the weather somewhat cooperated with partly cloudy conditions, that is, until the sporadic gulley washer provided a downpour. But, it did not last long nor interrupt the show. Again, most of our tables were filled with our regular dealers, however we did have a few visiting dealers filling in where people had a schedule conflict. We thank all of the dealers for their time, effort and displays. This month, the hotel's parking lot held lots of cars, but we did not see other events near us at the hotel. It could be people rested at the hotel for events elsewhere in the area. It's that time again to begin promoting next year's shows. Both visitors and dealers found our newly printed flyers with the dates for the 2019 Greater Atlanta Coin Show. You can also find the new dates on the Show Dates page. As usual, this September Sunday was another fine day to be out and about visiting a coin show. Now, let's take a virtual look at a few items seen at this month's show. The first coin is a colonial coin from Mexico with a denomination of two reales. "The real was a currency of Mexico, issued until 1897. There were 16 silver reales to 1 gold escudo, with 8 tlacos to the real. The peso, which circulated alongside the real and eventually replaced it, was equal to 8 reales. "The first reales issued in Mexico were Spanish colonial reales. Spanish colonial silver coins were issued in denominations of ¼, ½, 1, 2, 4 and 8 reales, with gold coins for ½, 1, 2, 4 and 8 escudos." "This specimen is one of a series minted 1773-89 in Mexico City during the reign of Charles III. "Assayer FM is recorded for 1772-78. The Mexico City mint, opened in 1538, is still in operation. In their population reports, PCGS (Professional Coin Grading Service) has graded 14 of these coins beginning at VF-20 and the highest being AU-55. Similarly, NGC (Numismatic Guaranty Corporation) has certified ten with their lowest grade at VG and their highest at MS-64. 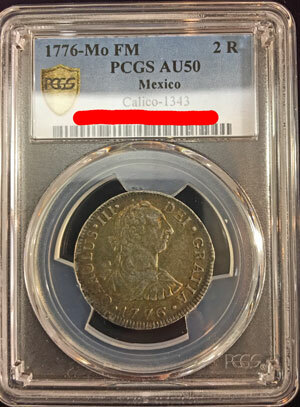 As an AU-50, this coin is a nice example of colonial coinage from Mexico and one of the top certified by PCGS and NGC. "Specification: 6.77 grams; .903 fine silver; .196 troy oz ASW." In looking at this certified holder, the Mo specified the mint mark for Mexico City, FM represented the Assayer, 2 R showed the denomination while AU50 denoted the grade. The Calico 1343 appears to refer to an entry in the Numismatica Espanola reference book originally written by F. & X. Calico with Joaquin Trigo. This book included a complete reference for all Spanish and Spanish colonial coins from Ferdinand-Isabel to present, which also addressed those minted in Mexico. Similarly, the next coin is an eight-Real coin from Spain. From Wikipedia, "the real (meaning: "royal", plural: reales) was a unit of currency in Spain for several centuries after the mid-14th century. The most common denomination for the currency was the Real de Ocho or Spanish Dollar used throughout Europe, America and Asia during the height of the Spanish Empire. "The first real was introduced by King Pedro I of Castile in the mid 14th century. The famous "piece of eight," also known as the Spanish dollar, was issued in 1497 as a trade coin.It later became widespread in North America and Asia. "The 'piece of eight' was so-called because the denomination was divided into eight silver reales (8 reales = 1 piece of eight). In addition to the "piece of eight," which was a one-ounce (28 g) silver coin, other coins based on it were issued: 4 reales, 2 reales, 1 real and the little (12 mm diameter) half real." "Eight reales of 1776, Seville mint; very attractive and rare, with some original luster, extremely fine. "This type was issued at Seville 1772-79 and 1788. While the bust issues of Charles III are more available than earlier octolobe types, they are still scarce and pricey. 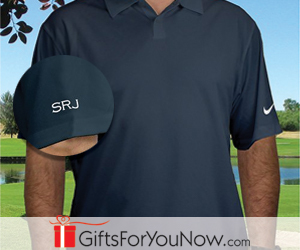 "Specification: 27.47 g; .903 fine silver; .785 troy oz ASW. " In looking at the population reports, PCGS has certified a total of three, one at VF-35 and two at XF-40, while NGC does not currently show any certified. 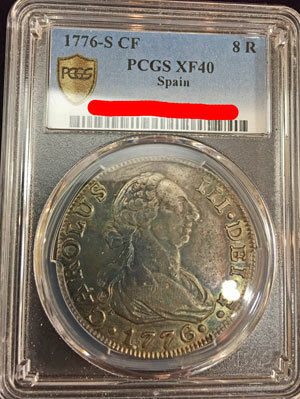 In other words, this eight reales Spanish coin is the finest one of the three certified by PCGS - a very nice specimen, indeed. The next coin is another Spanish style, the escudo from Columbia. From Wikipedia: "The first escudo was a gold coin introduced in 1535/1537. It was initially worth 16 reales. When different reales were introduced, the escudo became worth 16 reales de plata in 1642, then 16 reales de plata fuerte or 40 reales de vellón from 1737. "Gold coins were issued in denominations of ½, 1, 2, 4 and 8 escudos, with the 2 escudos coin known as the doubloon. "This specimen is one of a type struck at Popayán 1772-89. The Colombian mints (Popayán and Nuevo Reino) concentrated on minting gold, to the near exclusion of silver which predominated at the other colonial mints. While this makes Colombian colonial silver coins expensive, Colombian colonial gold is (comparatively) reasonable. "Specification: 3.38 g; .901 fine gold; .098 troy oz AGW. " Looking at the population numbers for the 1776-P SF from Columbia, PCGS has certified three, one at VF-35 and two at AU-53. To date, NGC has certified five, three at VF, one at XF-40 and one at XF-45. 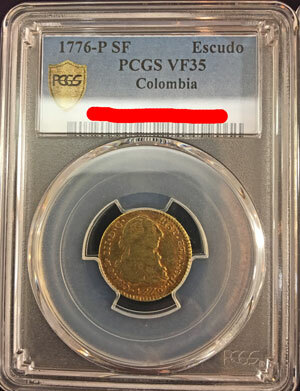 Though not the highest of the graded few, this Columbia 1776-P SF escudo is a beautiful collectible gold coin. The next coin on our list, an American Eagle Platinum coin, is reminiscent of the 1986 Statue of Liberty Commemorative Gold Five-Dollar Coin, however the design comes from a different designer. 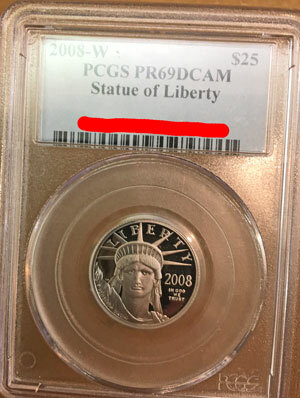 For this obverse of a 2008 Statue of Liberty Platinum American Eagle $25 Coin, John Mercanti designed Liberty's face, not quite as close as the 1986 coin, but still a close-up. The Platinum American Eagle bullion coins began in 1997 in the following denominations and sizes: $10 for 1/10th ounce, $25 for a quarter ounce, $50 for half ounce and $100 for a full ounce. The US Mint continued to produce all the platinum bullion coins from 1997 through 2008, but in 2009 they began only producing the one-ounce platinum coin. Interesting to note, the US Mint chose to place the same reverse design on all of their regular strike platinum coins, but placed a different reverse design on their proof platinum coins. All of the bullion coins from 1997 through 2008 had the eagle in flight while the proof coins' reverse varied uniquely with some designs following a theme. For this particular year, 2008, the regular strike had the eagle in flight, while the proof coin had the Judicial Branch "Foundations of Democracy" series design. In 2008, the US Mint struck 4,153 of the $25 Platinum American Eagle proof coins at their West Point location. Of these proof specimens, PCGS has graded one at PR-67, one at PR-68, 512 at PR-69 and 292 at PR-70 or just under twenty percent of the population. It may not be a PR-70, but as a PR-69 Deep Cameo, this example is certainly one of the most beautiful proof Platinum American Eagles. The US Mint began producing the next coin, the Gold American Eagle, in 1986. Each year, they produce four different sizes and denominations of the gold eagle. 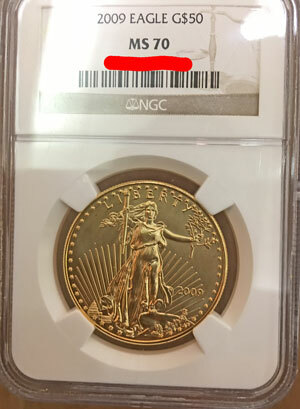 NGC graded this example as the highest grade available, MS-70. "First struck in 1986, the Gold Eagle coin program is one of the world's most popular gold coin programs. The coins are available in 1/10oz, 1/4oz, 1/2oz, and 1oz sizes, with face values of $5, $10, $25, and $50, respectively. "2009 saw the second highest mintage of $50 gold eagles ever at nearly 1.5 million. Quality wasn't spectacular though as only about 30% of the coins submitted to NGC graded MS70." The Mint's Philadelphia location struck 1,493,000 of the gold $50 coins in 2009. Of all those minted, NGC has graded just under 35,000 to date. They graded 3,794 as MS-70 and 6,634 as Early Release MS-70. PCGS, on the other hand, has certified the 2009 regular strike gold eagle across four grades, MS-67 and up, for a total of just over 4000 coins. Of those, 726 made the MS-70 grade. In summary, this bullion coin with its obverse design by Augustus Saint-Gaudens is a beautiful example of the Gold American Eagle series. Those five coins are just a small sampling of the intriguing items found on the bourse each month. Our dealers represent a broad range of numismatic interests and display coins, currency, bullion, exonumia, scripophily and other collectibles. Visitors can find items from the ancient, thousands of years old, to the modern, just minted within the last few weeks. People can find bullion from low to high-dollar face value and from thin and lightweight to heavy bars. Exonumia, numismatic items other than coins and paper money, such as tokens and medals, can also be found in the dealers' showcases. People interested in scripophily such as scrip, stock certificates, letters and other paper financial collectibles can discover those on the bourse as well. Being collectors at heart themselves, if the dealers find interesting objects that are not coin related, they display those items too. Visit the next Greater Atlanta Coin Show on Sunday, October 14, 2018, in the Joe Mack Wilson ballroom to see what new and interesting numismatic and collectible articles the dealers have in their showcases.